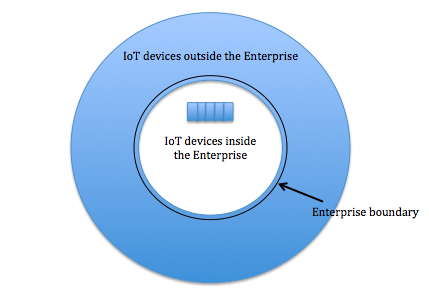 According to Gartner, “Internet of Things (IoT) is the network of physical objects that contain embedded technologies to communicate and sense or interact with their internal states or the external environment.” The communication of these physical devices with itself and/or with its environment (e.g., other physical devices, information systems etc.) generates tremendous amounts of data. Depending upon the end goal, this data can be used anywhere from determining the foot traffic in retail stores to monitoring environmental effects on trees. Since there are so many different uses of the data generated from these IoT devices thus it is difficult to determine how many of these devices would be used in the future. However, Gartner has taken a stab at this and estimates that within 6 years (by 2020) there would be about 26 billion active IoT devices in use. With so many devices in use within a short period, it would be naïve of organizations to think that these IoT devices would have no affect on existing business models and operations. Who uses them? Who should use them? What business processes use them? What business processes would use them? Where is the data being captured? Where should the data be captured? When are they used? When would they be used? Why do they affect the bottom line? Why would they affect the bottom line? When you are asking the above questions, keep in mind that organizations who know how to increase the bottom line through the effective use of technology would get into your space even before you think they are your competition. This means that as an organization, you have a choice of either ignoring the IoT revolution or getting ahead by fully immersing yourself into how IoT can provide competitive advantages across all business units. In conclusion, while it may seem that IoT is only an “IT thing” but in reality IoT affects the business-side more than it affects the IT-side and not leveraging it can mean the difference between staying alive or quickly becoming irrelevant. When evaluating ANY technological innovation as a consumer there is only one question to ask. Who is this serving? If the answer is ‘the vendor’ then you should reject the tech outright. If it doesn’t serve you then it’s a waste of your time and money and (most importantly) your attention.